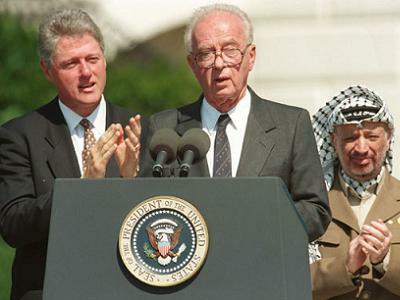 Twenty-three years after the famous handshake between Palestinian leader Yasser Arafat and Israeli premier Yitzhak Rabin, some Palestinians now say that the Oslo Accords – which opened relations between the two sides – was a major mistake. Signed on Sept. 13, 1993, the Oslo Accords were the first direct agreement between Arafat’s Palestinian Liberation Organisation (PLO) and the Israeli government. With the signing of the accords, the PLO acknowledged the state of Israel on 78 percent of historical Palestine, while Israel recognised the PLO as the “legitimate representative” of the Palestinian people. Abd al-Sattar Qasm, a political science professor at Al-Najah University, however, believes the accords were a “historical mistake”. “Through Oslo, the Palestinians recognized Israel, and, in return, Israel acknowledged a Palestinian interim self-governing authority – not a state,” Qasm told Anadolu Agency. Under the terms of the Oslo Accords, Qasm noted, key issues – including the status of Jerusalem, refugees, Jewish settlements, security arrangements, borders, international relations, water, communications and airspace – were all put off until future “permanent-status talks”. According to Qasm, the Oslo Accords have allowed Israel to assert its control over the Palestinian territories without having to bear the cost of an expensive military occupation. “Israel has succeeded over the last 23 years in controlling the Palestinians via security coordination [with the Palestinian Authority], arrest campaigns, and frequent incursions, all of which are a result of the Oslo Accords,” he said. He went on to point out that, since the signing of the accords, Israel had invaded the West Bank in 2003 – where it besieged an aging Arafat – and had waged three devastating wars (in 2008, 2012 and 2014) on the blockaded Gaza Strip. 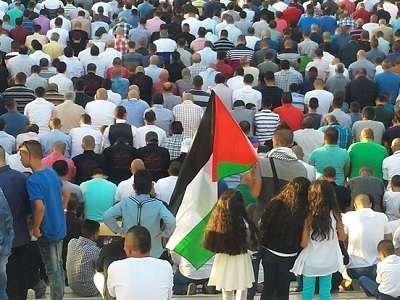 “By signing Oslo, the Palestinian leadership – which thought Israel would give them a state – has brought its people into a long, dark tunnel,” Ahmad Rafiq Awad, a Palestinian expert on Israeli affairs, told Anadolu Agency. “The only viable solution for the Palestinians now is to abandon the Oslo agreement and choose the option of armed confrontation with Israel,” he said. Awad went on to assert that certain Palestinian political figures were actually benefiting financially from the Israel’s decades-long occupation and did not want to challenge the status quo.